The Rutter's Corporate Fleet Card combines the ease of consolidated fuel expense reporting with pay-at-the-pump convenience. Rutter's Corporate Fleet Card program is powered by Mannatec, one of the largest fleet card processing systems in the world. 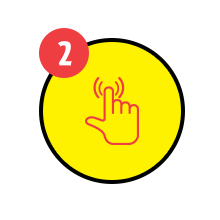 Fleet expense management made easy. The Rutter’s Corporate Fleet Card combines the ease of consolidated fuel expense reporting with pay-at-the-pump convenience. 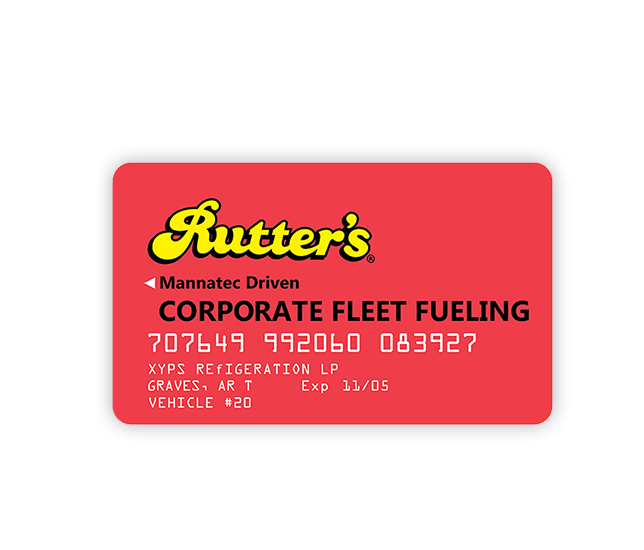 Rutter’s Corporate Fleet Card program is powered by Mannatec, one of the largest fleet card processing systems in the world. Greater control over fuel expenses. Restrict fueling to specific days of the week. Restrict fueling to time of day. Limit number of transactions per day. Unique 5-Digit Driver ID's will be required for each fuel purchase, ensuring a secure transaction. One consolidated report shows transactions for all card users. Simple access to copies of all your invoices. Track purchases for all vehicles under one program. Eliminate the hassle of collecting, recording and reconciling fuel receipts. Tax exempt billing available for qualifying organizations. Download the Rutter's Fuelman Application or pick one up at any Rutter's Farm Store. Choose from a Rutter's Private Label card or Rutter's Fuelman Network Card. Provide vehicle descriptions and driver names. We sell three grades of gasoline, kerosene and some of our farm stores have a dedicated diesel bay for truckers. Which makes pulling in, filling up and heading back out painless for truckers and car-drivers alike. York Store #8 129 Leaders Heights Rd. East Berlin Store #17 2115 East Berlin Rd. Quality You've Come to Expect. For the better part of a century, the Rutter name has been synonymous with high-quality product and world-class customer service. Rutter’s gasoline is no exception. Our process to deliver the finest quality petroleum products to our customers has numerous stages. It begins with gasoline that is produced by major domestic refineries. Next, we supplement the gasoline with additives and detergents that contain agents that help prevent, diminish and even remove harmful engine deposits. Finally, we use a controlled environment and underground storage tanks supplied with fuel-level monitors to guarantee our gas is top quality when it reaches your automobile. Our storage tanks also employ sensitive electronic monitors and filters that continuously screen the gasoline's condition and stop the stream if water or sediment is detected. Because we're committed to delivering superior gasoline that our customers can rely on, we guarantee its effectiveness. If our gasoline causes a problem, we'll pay for the repair. Q: Where does Rutter's gas come from? A: Rutter's does not buy or refine crude oil from any country; we buy gasoline and diesel from only major refineries in the United States. Rutter's is committed to purchasing gasoline responsibly while providing the highest quality products to our customers. We buy almost our entire petroleum product from refineries that publicly state that they do not import oil from the Middle East. Q: What do the "Now Contains Up to 10% Ethanol" decals on the fuel pumps mean? A: These stickers are to inform you that the gasoline we offer is E10, which is a blend of 90% gasoline and 10% ethanol. Supplementing gasoline with ethanol is a common practice in Pennsylvania. This is because the gasoline formula being sent through the pipeline requires a 10% ethanol blend to function properly in an automobile. This mixture creates a gas product safe for use in most automobiles. Q: Can I use E10 fuel in my motorcycle, lawnmower or boat? A: It could be possible. You should review your owner's manual for this information. Q: Does E10 fuel affect the fuel mileage in my automobile? A: E10 fuel typically generates a fraction less power than conventional gas and may reduce your mileage. Compared to 100% conventional gasoline, that is. Q: Does using E10 fuel affect my automobile's warranty? A: Every gasoline-powered vehicle produced by both foreign and domestic major manufacturers since 1980 is capable of using E10 fuel. Many manufacturers of recent-model automobiles actually recommend the use of E10 fuel. However, we still recommend that you check your owner's manual for details. Q: Why does my bank say that Rutter's is "holding" pre-authorizations funds? A: Occasionally, our customers make inquiries about charges that appear on on-line banking or voice response systems that are not equal to the amount of gasoline that was purchased. These amounts can range between $25 and $75. These are usually called "pending charges" or "pre-authorization holds" by financial institutions. These charges are applied to the account by the customer's bank. Rutter's does not place these types of holds on customer accounts. We follow the guidelines laid out by the credit card companies, like Visa and MasterCard, by obtaining card validation information prior to turning on the gas pump. Each financial institution handles the request for card validations in a different manner. Some will "hold" funds for gas purchases. The amount that each bank holds as well as how long the hold lasts varies depending on the bank. Your financial institution will be able to provide you with their policies, which are generally found in a document called "Deposit Account Agreement" or "Electronic Funds Transfer Agreement". If the question is related to a credit card account, the document may be called a "Truth in Lending" or a "Credit Account Agreement". Put the Rutter's Corporate Fleet Card to work for you!